one puppy at a time. My name is Paula and my family and I breed bernedoodles on our small ranch in Montrose, CO. There has been a lot of love, joy, and tears through the years – all making us better breeders. We absolutely love our pups and love our families, growing new relationships is one of the best parts of this job! If you choose us as your breeder, we will work hard to meet all your expectations and deliver you the perfect puppy! We are blessed to be making the world a better place one puppy at a time! Our dogs are more than just pets–they are family! Each of our breeding dogs have been hand selected for their health and good temperament. Our dogs grow up in a loving, family oriented environment and are socialized from a young age. All of our moms and dads have passed genetic testing specific to their breed. 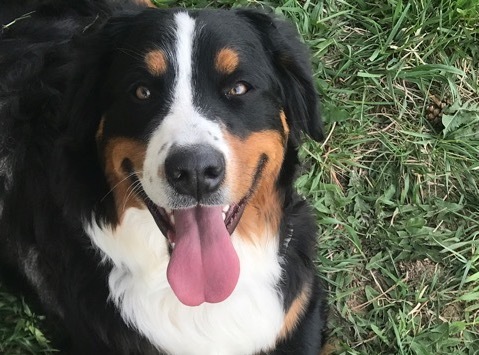 Zena is a beautiful berner with stunning colors, she is full of life and excitement. Zena’s European lines show in her classic stocky build, we can’t wait to see her pups, they are sure to be special! Brooklyn is a beautiful tri-color standard poodle. She has a soft fleece coat, and her markings are amongst my favorites! She is a trained service dog who brings a smile to everyone she meets. Belle is a wonderful blend of sweetness and mischief! Belle has an uncanny resemblance to Kat and we expect her pups will be just as adorable! Belle lives with with a guardian who loves her dearly and is close to home! Bella is one of the friendliest, laid-back girls you will ever meet. Bella has never met a human she didn’t call her friend! She is from Snow White’s retirement litter and is sure to be an excellent mama. She loves living the country life with her guardian family. Beazus is a big kid with a big heart. Beazus came to us from Russia, her European lines give her that “old world” look that we love. Beazus is devoted, playful, and loving; everything we look for in a Berner! Clarke has a zest for life! Her loving and playful personality make her a joy to be with. She is just as beautiful on the inside as the outside. With her beautiful eyes and distinct markings, she is sure to produce beautiful puppies. Sophie is devoted, intelligent, and affectionate! Her silliness is surpassed only by her goodness. Sophie lives in one of our wonderful guardian homes where she lives an amazing outdoor life in beautiful Colorado! Chama is playful and free-spirited. Her lovable disposition and passion for life mean you are always bound to have a good time and probably a laugh. Chama and Clarke are sisters and cousins to Snow White! Flynn is a miniature tricolor poodle who weighs 17 pounds. He has a wonderful fleece coat with big waves. Flynn is a sweet and energetic poodle that has no trouble keeping up with the big dogs. He has produced stunning traditional tricolor litters with some of the prettiest coats we've seen! Rocky came from our Panda Puppy litter. He has some of the most vibrant colors we’ve seen. Rocky is as sweet as he is mischievous! 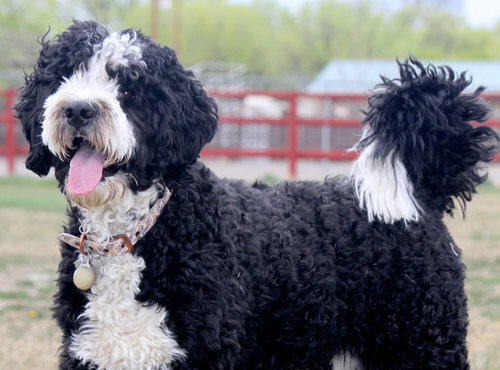 He loves the farm life with his guardian family here in Montrose, CO.
Sully is a gorgeous tricolor poodle. He is playful, curious, and full of energy! Sully is a "moyan" poodle which is a small standard poodle. He weighs 45 pounds and when bred with a Bernese he will produce small standard bernedoodles! Sully has produced many beautiful tri-color pups! Max came to us from Fort Worth, Texas! He is a rootin’ tootin’ puppy if ever there is one. Full of love and cheer, Max is one of the happiest guys we know! Retired August, 2017 Thank you Kat, you did such a good job! We love you. Retired December 2018. Kahlu brought us the most beautiful, unique puppies. Every litter brought new surprises! Retired August, 2017 Thank you Snow, you made the world a better place! We love you. Retired November 2018. We kept Mala from our first litter with Snow White. It’s been such fun watching her grow up to be a wonderful mama. My very first litter as a bernedoodle breeder was with Cru. We ran into all kinds of complications with the delivery of Cru’s litter, and never have I seen such courage and fight as I did with Cru and her litter. Tragically I lost Cru, and my heart still hurts for her. Cru will forever be at the heart of Ranch House Bernedoodles. Over the years myself and my grown up kids have owned at least 6 doodles and they have all been exceptional. Now I hope to bless other families with the same quality of loving pets that we have enjoyed. My family lives in Montrose, CO and we are excited to breed bernedoodles. My goals for our puppies are a great temperament, good health, loving and fun personality, and intelligence!